Larry C. Kitchen received a Bachelors of Fine Arts degree from Sam Houston State University, and a Masters of Arts degree from The University of Texas at Tyler, Texas, where he attended on scholarship and received his degree with Distinction. Mr. Kitchen worked for several years as an illustrator and graphic designer for the Dallas based LTV Corporation. His clients included the Pentagon, NASA, Wilson Foods, Brannif Airlines, Emsco, Northrop Grumman, and Broadman Holman Publishing. He was awarded Gold and Silver Addys from the American Advertising Federation's Addy Awards. Mr. Kitchen served as "Artist in Residence" for the Hilmsen Art School in Salzwedel, Germany in 2013. He worked with graduate students from Houston Baptist University studying abroad. Mr. Kitchen's work has been and is currently on display at many locations from Germany to East Texas including: Monchskiche Museum, Germany, LeTourneau University, The East Texas Oil Museum, The Kilgore College Fine Arts Center, The University of Texas at Tyler Health Science Center, Texas Bank and Trust locations, Barron's Books of Longview, Primary Care Health Center, and others. Kitchen’s paintings have been exhibited in galleries and universities throughout Texas, including the Anne Dean Turk Fine Art Gallery, The Meadows Gallery at the University of Texas Tyler, Dallas Baptist Fine Art Gallery, L&L Gallery of Longview, Texas, The Wild Bunch Gallery, Lufkin, Texas, Fine Art Gallery of the College of South Plains and "Five Texas Illustrators" show at the University of Texas A&M at Commerce, TX. He has taught and lectured at several universities and colleges in Texas, and over the past thirty years directed the Visual Arts Department at Kilgore College in Kilgore, Texas. Larry now devotes much of his time to painting historical narratives. His commissions have taken him across the State of Texas and further in search of factual information to aid his work. Over the past two decades trips to Europe, Iceland, the deserts of West Texas, and Wyoming have proved inspirational and invaluable in building his paintings. 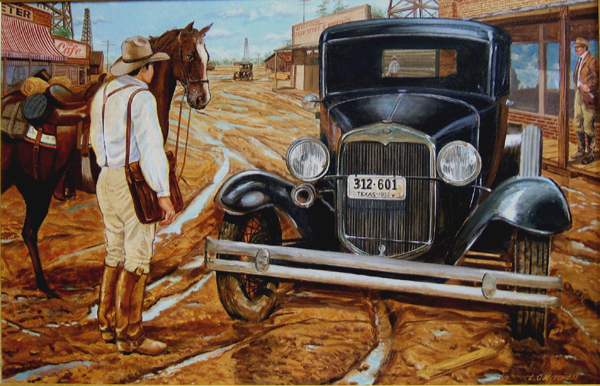 His works include the History Mural at The University of Texas Health Center in Tyler, Texas, "Downtown Gladewater, 1932" at the Gladewater Banking Center Lobby, in Gladewater, Texas, "Marshall Courthouse" at the Marshall Banking Center, in Marshall, Texas, . His work has also been featured in Tyler Today Magazine, in the article, "Larry Kitchen, Kilgore's Renaissance Man". He has also illustrated children's books entitled: Below the Huber Ice, and Good Enough available on Amazon.com. Larry resides in Kilgore, Texas with his wife, Laurie. 4 x 9 feet, oil on board. Please enjoy a slide show of some paintings I created over the last two decades. A hike in Big Bend, Country Nurse, Trading Up, da Vinci’s Rooftops, LeTourneau Mural, Vastergotland, Doorway in Salswedial, First Encounter, Young Dentist, Vastergotland, Oil Field Road, Dr. Ray Vet, Whale Mural, Musician, and Robinhood’s Bay, England. Hope you enjoy! It is really important to have a plan and process in your work. 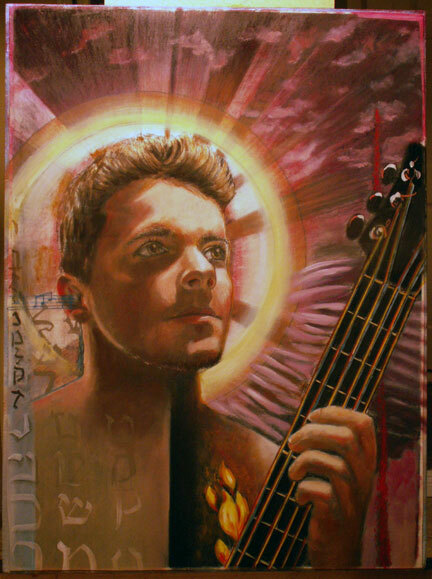 Here are two images that show part of that in the painting titled Musician. I started with thumbnails, followed by photos. Then photoshop to build graphic ideas such as the glow and streams of light coming from Levi in his angelic form. Notice the implied wings and ancient text, with gold leaf. Then came a full size grid to enable a very accurate drawing. That is the small set of squares on the illustration board on the right. 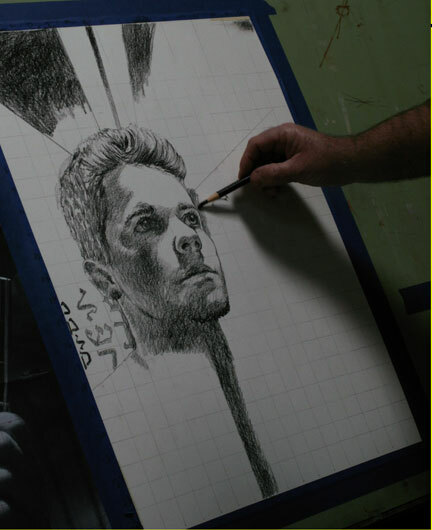 Using a soft 4B graphite pencil, I hit the shadows hard leaving most of the mid-tone areas and highlight for the paint. After sealing it with spray fix, I wash it with oil and terpenoid, and erased out the highlights with a kneaded eraser. Finally, I painted traditionally with oils. Gold leaf was last. You do that glue sizing and lay a thin sheet of the gold leaf on it and gently rub it down. If you want a highly polished, well rendered painting with a story that is clear, don’t forget PLANNING AND PROCESS. 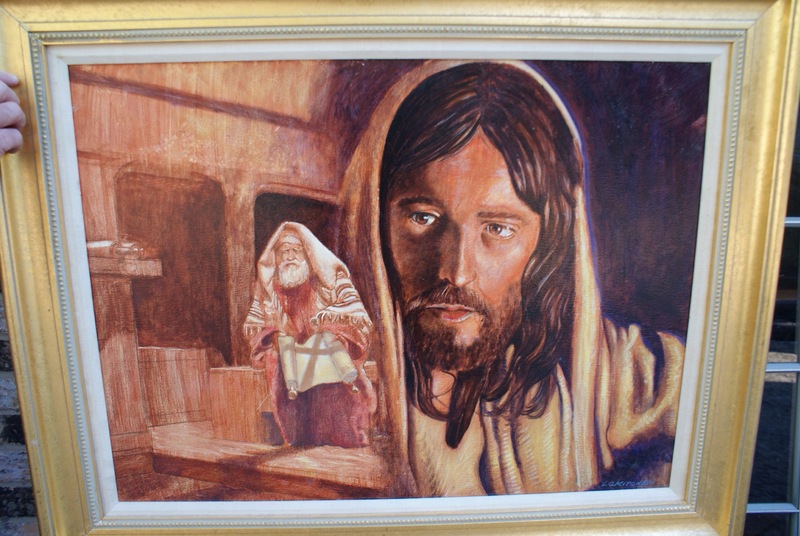 This is a painting in which Christ helps a Pharisee understand why the Messiah must suffer. The shadow of the cross laid across the scroll brings a focal point to this being foretold many years before. 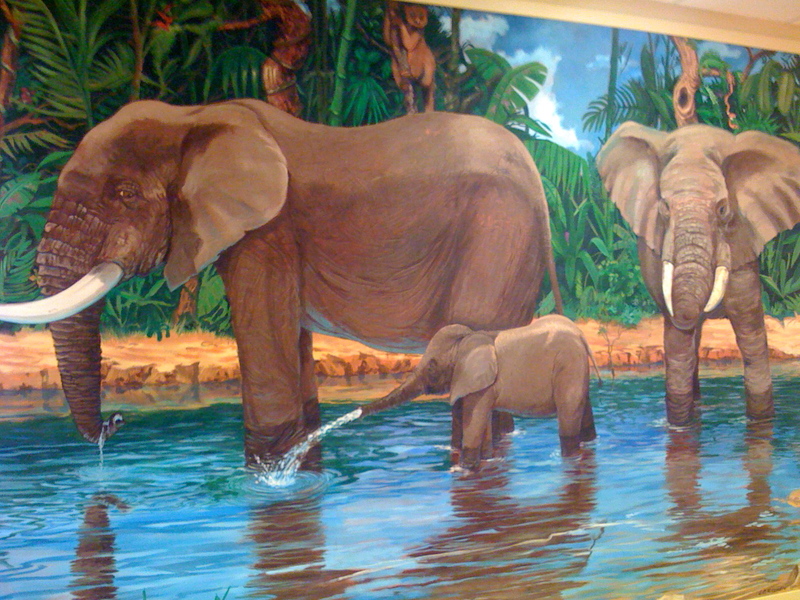 I created a mural a few years ago for a local Doctor’s Office. It is 9 foot tall by about 14 ft wide, oil on canvas. The skin was the fun part. I painted the canvas hot pink, by adding red to the gesso. Then, I painted a one foot wide strip down the middle, to establish the method for the various areas. The tropical plants were done with midtone bright green, shadow dark green, followed with a lime yellow highlight. The skin was created with a mid tone warm brown/gray, followed with the dark brown for wrinkles, then a light warm highlight. The reflections followed the mirror image of the animals, broken up with light blue waves, reflecting the sky. It was a fun job. I rolled the canvas on a pvc pipe, outward after it dried, and after transport, stapled it to the wall. A carpenter, (Danny Patterson) met me on site and created the frame, which he chopped and painted on the spot. Art in public places is great. We should have more of it, don’t you think? Off to England, Norway, Scotland and Iceland! The country of Iceland is thermal vented with steam and hot water. It sits atop of one of the largest fault lines on the planet. It is very active and growing. We will be in Reykjavik for 2 days on our cruise.